One of the priorities atop Yuko Sato’s list when looking for a job after graduation was that the university have a strong extension program. That university turned out to be Iowa State, to the benefit of poultry famers across the state. “Ultimately, whether we are working in industry or academia we are all educators in some way, and I was looking for a school with a strong extension program,” Sato said. I started in August 2015, so a little over two years. 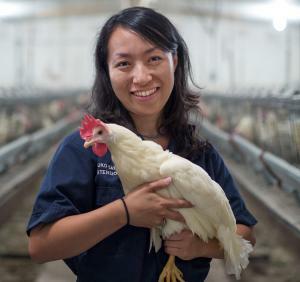 I am an assistant professor and poultry extension specialist. I provide service to commercial poultry producers and information to the community. For me, I like to do things with a lot of variety. I work broadly with poultry so I can work with chickens, turkeys, ducks or quail so I get to work with a great variety of birds. Everything I do has some sort of extension tie, whether it’s teaching or research. Whether I am working in the field, meeting with state employees or conducting workshops, everything I do has an extension component. Before coming to Iowa State I was a graduate student at Purdue University, working mainly with laying hens and turkeys. That background translated very well to Iowa. While doing my graduate studies, my major professor was in extension as was my advisor in vet school. Working with them drew me toward extension. I would like to create my own program. A lot of things I’m currently doing were handed down to me when I started, so I want to create my own program. I also really want Iowa State to be a center of excellence for poultry. We need a few more initial investments, but we have the number of birds in the state and if we get the right people, we are positioned to execute that. When I started my education, I wanted to work 100% in the dairy industry. I like to bake, I like hiking and playing board games. I make cookies almost every week, most of the time chocolate chip. I’ve gone hiking just about everywhere in this area, I don’t think there is a single park I haven’t hit. Keeping our food supply safe.